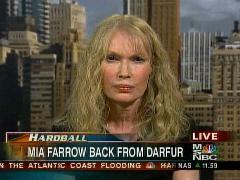 On last night's Hardball actress Mia Farrow slipped in the old "Bush went to war for oil," canard during a discussion about Darfur. MSNBC's Chris Matthews asked Farrow what she wanted the American people and government to do about the crisis in Darfur to which Farrow demanded: "Support the relief agencies, and urge our leadership. There is, of course, a lack of political will. There is no oil in Darfur, only human beings." Chris Matthews: "Well, tell us what the American people watching right now and what they're government can do. Individuals can't do much. What do they want or you want the government of the United States to do?" Mia Farrow: "Well, I, what has to happen and happen fast is a U.N. peacekeeping force has to come in, a robust peacekeeping force of NATO quality. Twenty thousand strong is what Kofi Annan recommended in January, and air support as well. And no one is talking about, you know, military takeover. We are talking about a robust peacekeeping force to bring a much need security to the region, and safety for the nearly four million people that the World Food Program is now keeping alive. What you have is humanitarians risking their lives in difficult and dangerous circumstances. Their own safety is in no ways insured, and they are really sustaining this very vulnerable population. So what we can do is two things. We can support the humanitarian agencies. UNICEF, for example, has only 20 percent of what it needs to continue its work in Darfur, and other agencies are in similarly strapped straits. So support the relief agencies, and urge our leadership. There is, of course, a lack of political will. There is no oil in Darfur, only human beings."